This ornate gold charm is very pretty rendition of the Hamsa Hand, a popular design in Jewish jewelry, that would grace a charm necklaces. weighs a comfortable 1.60 grams. Made by hand with an impressive top quality polished finish. 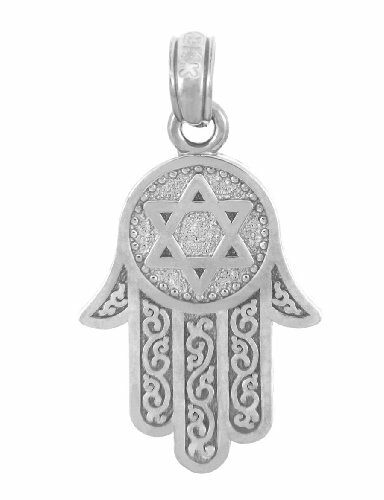 If you have any questions about this product by Jewish Jewelry by FDJ, contact us by completing and submitting the form below. If you are looking for a specif part number, please include it with your message. New 0.925 Sterling Silver 1.375" Oval Miraculous Virgin Mary Antique Finish Pendant 3.3mm Rope Necklace, 24"